One-click upgrade your PostgreSQL to version 9.5 and 9.6 now available! 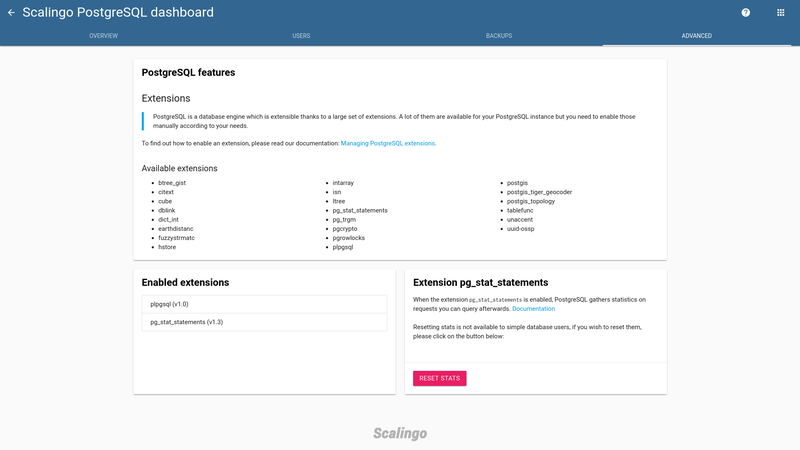 Scalingo provides up-to-date database addons with straightforward upgrade. 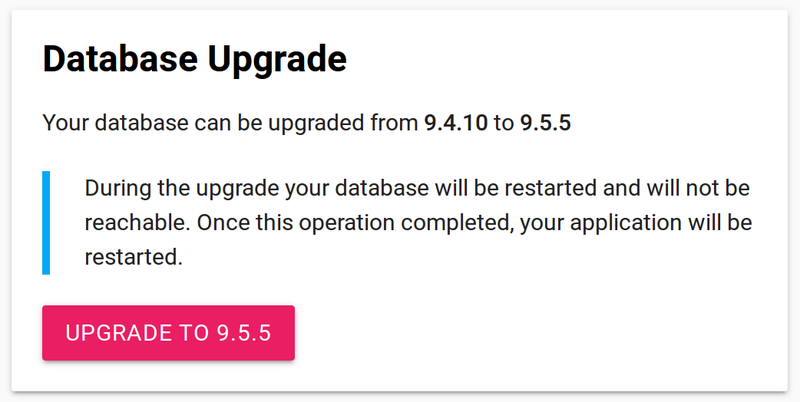 We just turned on the ability to upgrade your PostgreSQL databases to versions 9.5 and 9.6. In the process, we also updated the “Advanced” tab of the Dashboard with the ability to administrate PostgreSQL extensions. Let’s go for a tour on the wonderful world of PostgreSQL 9.5 and 9.6. This upgrade can take some time for the biggest databases. During the process, your database will be taken offline. You will first have to upgrade to 9.5 before being able to upgrade to 9.6. We are deploying today versions 9.5.5 and 9.6.1. As usual, you can find the corresponding Docker images on our docker hub repository. We’ve always think about our database addons as a Database as a Service (DBaaS). That’s why it’s obvious that we provide a smooth automatic process when you want to upgrade your database (unlike some of our competitors!). Here at Scalingo, we fully assist you with your database. However we were not completely satisfied with the way we automated the PostgreSQL upgrade. That’s why, during our work on PostgreSQL 9.5 and 9.6, our team revamped the way we handle the backup and restore of your data. Up to now, we first stopped the database, did a backup with pg_dump and a restore with psql. For the biggest databases hosted on Scalingo (tens of GB! ), the whole process could take several tens of minutes to finish. That’s a lot of downtime for a production database! After some modifications in our workflow, we are now able to use the pg_upgrade tool to handle this process. The downtime is only a dozen of seconds! Running a specialized pg_upgrade container to handle the migration of the data: this container is open source and is available on our docker hub repository. You can easily test the migration form 9.4 to 9.5 locally with docker run -v /path/to/data:/var/lib/postgresql scalingo/pgupgrade:94to95 /pg_upgrade. Running the database container with the new version: once again, the Docker image is open source and you can test locally that everything is working fine with a simple docker run -v /path/to/data:/var/lib/postgresql scalingo/postgresql:9.6.1-1. The PostgreSQL dashboard also received some love to provide you with more control over the extensions. First of all, the “Advanced” tab now displays in a block the list of extensions you installed and their version. Second, the pg_stat_statements gathers statistics about requests. You may need to reset these statistics. To do so, you must query the database with admin rights (using the pg_stat_statements_reset function). As you do not have these rights on Scalingo databases for security reason, we now give you the ability to reset the statistics with a button on the dashboard. If you need to do some other query with admin rights, feel free to ask us at support@scalingo.com. We may consider adding a specific button in the dashboard. Eventually, the stats on the “Overview” tab (memory and swap usage, database connections and data size) are now automatically updated. No need to reload the page anymore! You can now talk about the new features introduced in PG 9.5 and PG 9.6. PostgreSQL 9.4 was initially released in December 2014. The 9.5 version being released in early 2016, it has been a long year of work for the PostgreSQL Global Development Group to release this version. The long awaited PostgreSQL 9.5 delivers the not-less-expected UPSERT query. UPSERT is shorthand for INSERT, ON CONFLICT UPDATE. It allows new and updated rows to be treated the same. Example from the PostgreSQL wiki. This version also provides better performances for sorting of varchar, text, numeric fields. For a comprehensive list of what is new in this version, please refer to this blog post from the official website. With a shorter gestation, this version still has some really interesting features. The most important being the support for parallelizing some queries operations, in order to return query results faster. The speed up depends on available cores. Second, PostgreSQL full text search now supports “phrase search”. Former version of PostgreSQL allows basic boolean searching on collection of words, but it was not possible to have any kind of relationship between these words. For example, a word search on “Scalingo New Features” returns documents where those three documents are separated by pages of text or tied together. The work on the performances of such search is still active. Expect more in the upcoming version 10.0!